Amazon ElastiCache makes it easy to deploy and manage a highly available and scalable in-memory data store in the cloud. Among the open source in-memory engines available to you for use with ElastiCache is Redis, which added powerful geospatial capabilities in version 3.2. 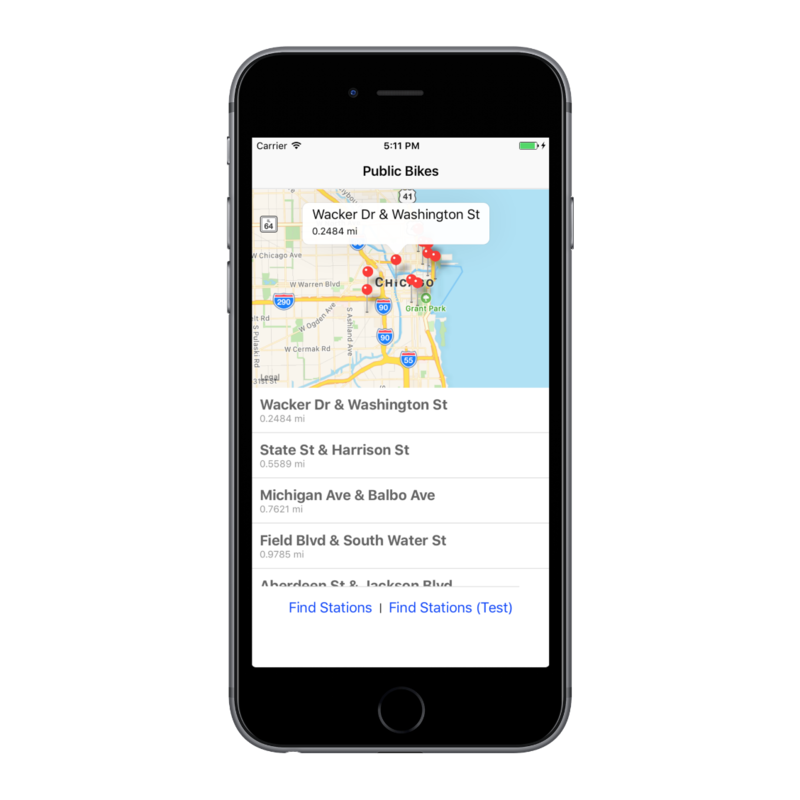 This post explores using these capabilities to build an app that locates nearby bike share stations in Chicago. You can easily extend the app to other cities or to use other geo datasets. You can use Amazon ElastiCache to accelerate your high volume application workloads by caching your data in-memory providing sub-millisecond data retrieval performance. When used in conjunction with any database including Amazon RDS or Amazon DynamoDB, ElastiCache can alleviate the pressure associated with heavy request loads, increase overall application performance and reduce costs associated with scaling for throughput on other databases. As an AWS managed service, Amazon ElastiCache also removes the undifferentiated heavy lifting involved with administrating Redis. There are a variety of application patterns that can be used to leverage ElastiCache with your data, some of which will be discussed in this post. Bike sharing programs are becoming increasingly popular in major cities throughout the world. Our app will enable users to search for nearby Divvy bike share locations in Chicago. In this post, we will explore the associated backend services, as shown in the following image. We’ll use the AWS Serverless Application Model (SAM) to manage and deploy our AWS resources, including supporting storage (DynamoDB and ElastiCache). SAM extends AWS CloudFormation to simplify deployment of serverless functionality, including AWS Lambda and Amazon API Gateway. SAM also eases deployment using specialized tasks available in the AWS CLI. 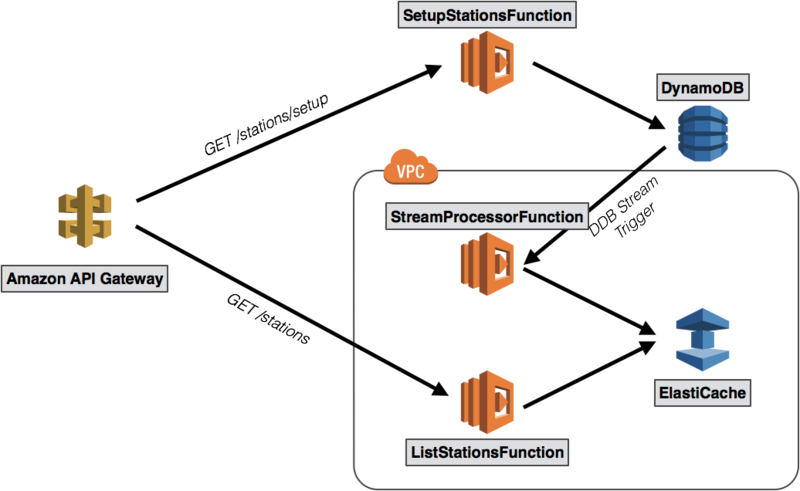 Reviewing the architecture above, our SAM template will create two public-facing API actions, one to prime our data store (SetupStationFunction) and one to find nearby stations (ListStationsFunctions). It will also create an ElastiCache cluster, DynamoDB table (our system of record), and DynamoDB Stream as well as a Lambda function to process that stream (StreamProcessorFunction). Complete sample code for our example is available at https://github.com/awslabs/elasticache-geospatial-public-bikes. The README provides detailed instruction on how to deploy the application in your own environment, making use of AWS CloudFormation. When working with ElastiCache, you can use familiar libraries to connect to and interact with your Redis and Memcached clusters. Here, we will demonstrate an integration with Redis using a popular open source library for Node.js (redis). The version of the redis library used in this sample (version 2.6.5) doesn’t yet directly support Redis GEO commands, so here we make use the generic send_command function. In the preceding sample, Redis will return up to 10 stations within a 2 mile radius of the current user. The response will also include the distance (in miles) and the coordinates of the station. For our example, station name, coordinates, and distance will be the extent of the data that we return to the user. You may wish to append additional data in some manner, for example, via another query against ElastiCache or DynamoDB. We’ve now demonstrated how to add geospatial data to Amazon ElastiCache for Redis and query that data to identify nearby bike share stations. Now you can easily use this data in a mobile app or website. In examining the sample code, you will notice that this code is part of our DynamoDB stream processor function. To remove a station, we remove it from the source data (in this case, DynamoDB) and the processor propagates that change to ElastiCache. Notice that our stream handler contains logic that examines the type of operation (record.eventName) and then perform the necessary action as described in the preceding sections. With our API complete, we can use it to power a mobile application such as the React Native sample included in our same code. The mobile application can pass the user’s current location to our backend API, which returns a listing of nearby bikes stations. The app then parses and displays these stations, along with each station’s distance from the user’s current location. Although our goal in this post is to describe a general approach for managing and querying geospatial data in Amazon ElastiCache, you can also extend the sample code in several meaningful ways. First, you can load the full set of Divvy bikes locations (note that DynamoDB’s batchWrite function supports a maximum of 25 records at a time). You can also load bike stations in other cities, such as New York, San Francisco, or Melbourne, Australia. Or you can modify the sample further to build a restaurant finder or plot local points of interest. Amazon ElastiCache for Redis can enable advanced geospatial capabilities by using the Redis 3.2 engine for numerous use cases that require low latency and high performance. Redis Geospatial capabilities are available in ElastiCache today! Josh Kahn is a solutions architect at Amazon Web Services. He works with the AWS customers to provide guidance and technical assistance on database projects, helping them improve the value of their solutions when using AWS.